There is a lot of disagreement over whether contingency fee arrangements between client and lobbyist should be permitted. Many cities, counties, and states prohibit arrangements where lobbyists are paid only if they succeed. The principal reason is that this arrangement encourages ethical misconduct. It encourages lobbyists to do everything they can to win, which may be good in a private adversary suit, but is not appropriate in a public context, where winning involves changes in public policy or obtaining public contracts, grants, or permits. Historically, courts have seen contingency fee arrangements relating to government action as leading to corruption and harmful to the public's trust in its government. But lawyers have argued that it works well for them, and allows more people to hire lobbyists (although there is no evidence that this actually occurs). An investigative piece in the New York Times last week shows what can happen when lawyers being paid via contingency fee arrangements lobby state attorneys general. What the lawyers are lobbying for is to have AGs bring suits that will help their clients, and them, win their cases. These lawyers are acting as procurement lobbyists, for themselves and their clients. AGs argue that they need the resources of law firms to bring such suits (which contend that consumers have been harmed by big companies). But there is much more involved in these transactions. Many of the plaintiffs' lawyers who bring these suits are former AGs who have personal and political relationships with current AGs. There are usually large campaign contributions involved, as well. "Over all, plaintiffs’ firms have donated at least $9.8 million directly to state attorneys general and political groups related to attorneys general over the last decade." When plaintiffs' firms don't have a former AG in-house, they turn to former AGs who act as brokers, pitching cases (i.e. lobbying) for these law firms. When many millions of dollars in legal fees are involved, there's a lot to go around. It would appear that everyone's a winner. State governments make lots of money when these cases are won and spend less money on cases that are lost, the lawyers do well, and incumbent attorneys general get big war chests to help them stay in office. Some of the companies that have been sued by AGs under these arrangements have made counterclaims that "the attorneys general improperly turned over state law enforcement powers to private parties, citing their financial incentive to push ahead with cases against them, even if the facts did not support the claims." Contracting out work is one thing; contracting out the responsibility over cases is another. Also problematic is the fact that these AG-law firm arrangements are no-bid arrangements. This means that the state pays millions of dollars to a law firms that has not bid for the job and that has made large campaign contributions to the office that has entered into a contract with it. This looks to the all the world like bribery. Some states are trying to limit these arrangements. In the last two years, at least 14 states have adopted new rules that generally require AGs to make a specific “finding of need for outside counsel.” Some of them now require competitive bidding and a limit on legal fees. They have treated these issues as procurement issues, not as government ethics, lobbying, or campaign finance issues. From a government ethics perspective, three additional things could be done. One, state lobbying codes need to include the lobbying of attorneys general (just as local lobbying codes cannot exclude city or county attorneys). They are too often excluded by definitions of "lobbying" that are limited to the lobbying of legislators or of only a limited list of executive positions or offices. 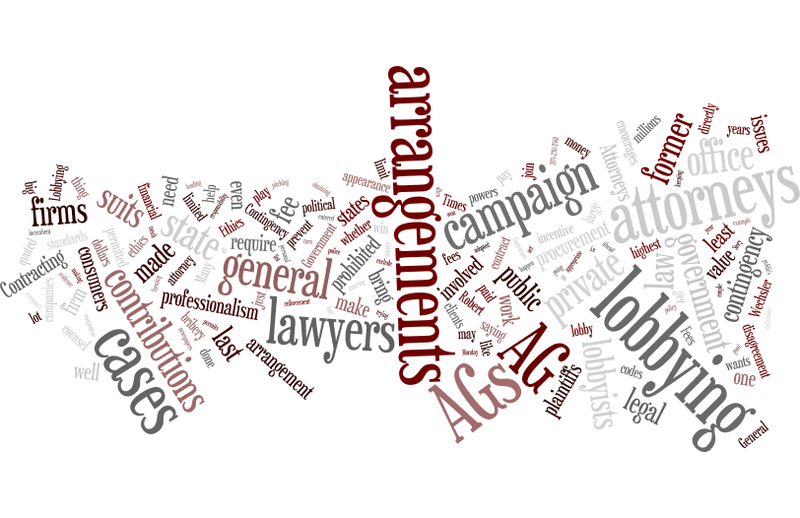 The lobbying of government attorneys should be disclosed just like any other lobbying. We can't hope that newspapers will do in-depth investigations to find out what has been going on. Two, contingency fee arrangements with lobbyists should be prohibited to prevent the appearance of bribery and pay to play that has occurred in these cases. However valuable such arrangements may be for consumers and accident victims, they are inappropriate to lobbying. A lawyer who enters into such an arrangement should not lobby, directly or indirectly. Three, lawyers seeking to work as AG contractors should be prohibited from making campaign contributions. And anyone who has made campaign contributions should not be permitted to get a contract. There is certainly a value in AGs farming out work in legal cases. And there can be a value in having AGs join private suits to protect consumers. But if an AG wants to do the former, he should follow ordinary procurement processes. And if an AG wants to do the latter, she should establish a formal process for handling requests to join private suits. The highest standards of professionalism require that an AG consider the appearance of impropriety and do what is necessary to prevent it. What this AG has done appears highly improper.